Neuroscientists are now convinced that the brain is capable of superior performance even into the 10th decade and beyond? If the brain remains healthy and free from disease, it can continue to function normally for as long as we live. Sustained brain health and enhanced lifelong learning are vital parts of aging and improve quality of life. Terry Eckmann, PhD, an associate professor at Minot State University in North Dakota and an advisory board member of the International Council on Active Aging, shares what you can do for your mental and physical health to promote a healthy brain. Neuroscientists recommend swimming, dancing, gardening, knitting, more frequent use of the non-dominant hand and leg, and walking 10,000 steps on a daily basis (Nussbaum 2006). Small (2006) encourages regular physical activity that includes an adequate cardiovascular workout. Medina (2008) suggests that aerobic exercise is the key to lowering the odds of getting Alzheimer’s by 60%. A daily 20-minute walk can cut the risk of having a stroke, one of the leading causes of mental disability in the elderly, by 57%. 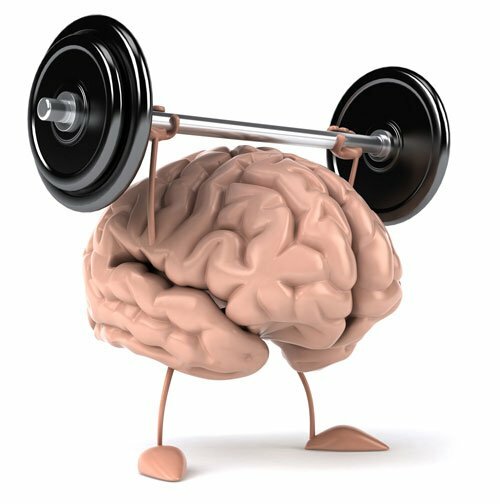 Ratey (2008) calls aerobic exercise Miracle-Gro® food for the brain, “fertilizing” cells to keep them functioning and growing. It’s important to use the brain to keep it healthy. Nussbaum recommends activities like playing board games, doing crossword puzzles, learning a second language, taking a class, increasing exposure to classical music and acquiring new skills. Small (2006) reports that participating in such leisure activities as playing board games, reading books or doing crossword puzzles cuts the risk of developing Alzheimer’s disease by nearly a third. Balanced nutrition is essential for body and brain health. The Dietary Guidelines for Americans (U.S. Department of Health and Human Services and U.S. Department of Agriculture 2010) provides science-based advice on food choices for good health. The guidelines recommend a diet that emphasizes fruits, vegetables, whole grains and fat-free or low-fat milk; includes lean meats, poultry, fish, beans, eggs and nuts; and is low in saturated fat, trans fat, cholesterol, salt and added sugar. Water is also essential for the electrical transmissions within the nervous system that make us sensing, learning, thinking and acting organisms. Do moderately intense aerobic exercise for 30 minutes a day, 5 days a week or do vigorously intense exercise 20 minutes a day, 3 days a week. Do 8–10 strength training exercises, performing 10–15 repetitions of each exercise 2–3 times a week. Strength training is important because it prevents loss of muscle mass and bone and is beneficial for functional health. If you are at risk for falls, perform balance exercises. If you don’t already exercise, it’s important to get started—and seek help if necessary. The general recommendation is that older adults should meet or exceed 30 minutes of moderate physical activity on most days of the week; however, it is also recognized that goals below this threshold may be necessary for older adults with physical impairments or functional limitations. However, if you can exceed the minimum amount of exercise, do it! Flexibility is also important. For each day older adults perform aerobic or strength training activities, they should take an extra 10 minutes to stretch the major muscle and tendon groups, spending 10–30 seconds on each stretch and repeating stretches 3–4 times. Published as a service of IDEA, the leading international membership association in the health and fitness industry, www.ideafit.com.